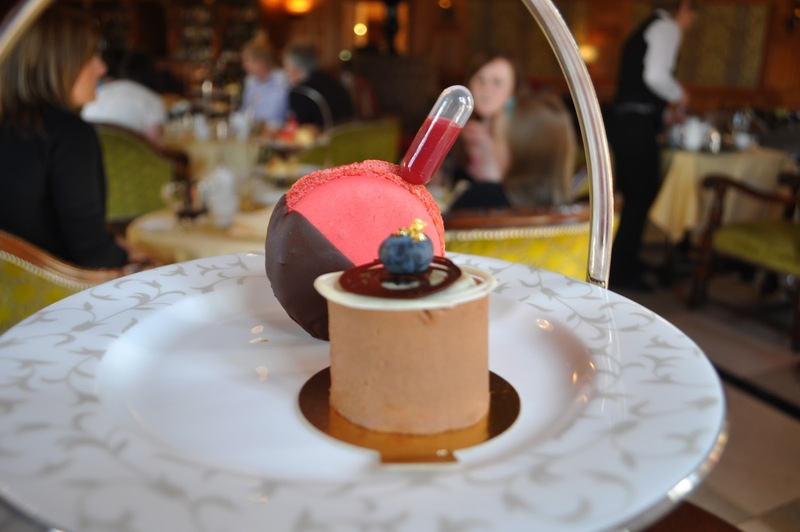 What's got us all mad for Afternoon Tea? Afternoon Tea has even played a part in women's rights where 19th century tearooms offered a safe place where the Suffragettes could gather to talk about equal voting rights without the accompaniment of men. These days we just have fun hosting or getting together socially and Afternoon Tea is a great treat on a special occasion. You don't have to know all about fashion either to be aware of the fashion choices Afternoon Tea offers you! It's quite acceptable in modern times to dress up for Afternoon Tea in daytime glamour and this really is part of the fun. Also, due to the history of Afternoon Tea, the vintage options are endless. Realising i needed outfits for these very occasions i took to the shops.. 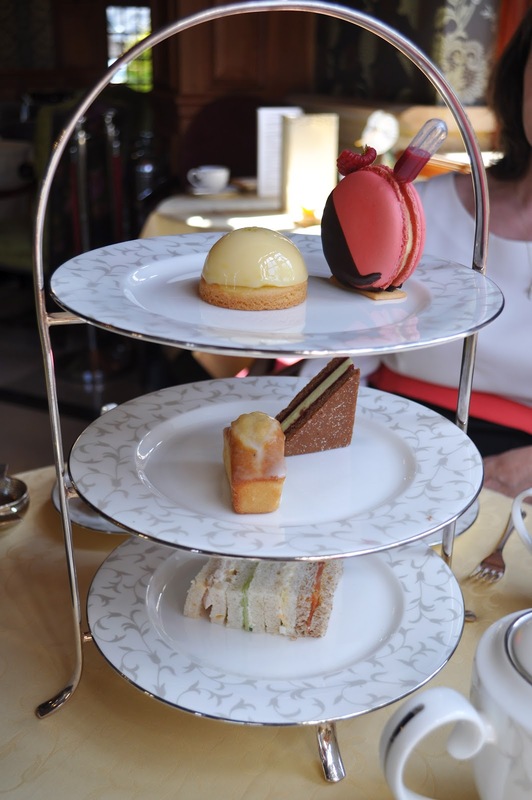 I looked into Pennyhill Park Hotel and Spa for Afternoon Tea and in my research, i looked for somewhere i could experience a traditional afternoon tea but with all the bells and whistles needed for a small celebration (a birthday). 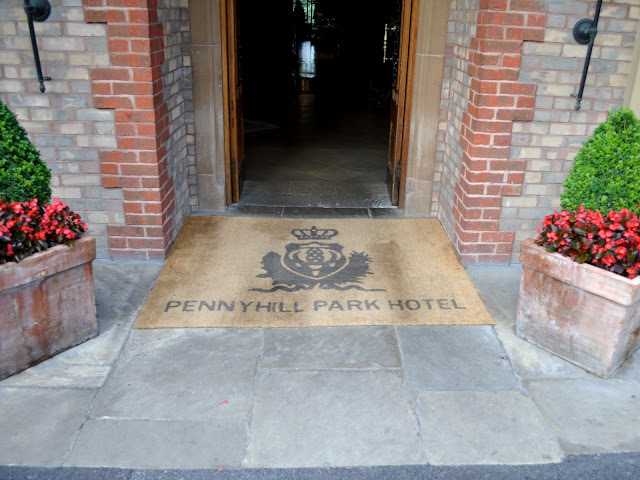 I have to admit, when i saw Pennyhill Park received a Tea Guild award for best Afternoon Tea in the City and Country Hotel category, i knew i could trust that certain standards would be kept to; both the tea served and the service itself. What also drew me to try this hotel was that they offer a gluten-free choice for people on a gluten-free diet, which i'm trying at the moment and means people on strict diets don't miss out. We were met with lovely grounds and staff wandering around only too happy to point you in the right direction, or just to greet you with a 'good afternoon'. The room itself was stunning and fit in with the country house style with wood panelling and green and magenta patterns. I was happy to see a piano there too, which is a staple of Afternoon Tea, but unfortunately no one playing it that day! We were shown to a table and once we were settled a waitress came to help us choose which tea to have. I found the lady very informative and happy to tell us what her favourites were while all being very relaxed. 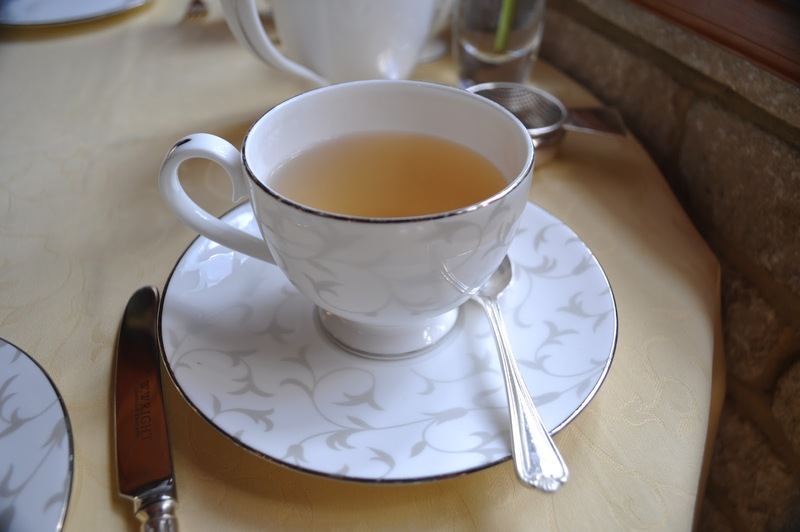 There was an extensive tea menu to suit all tastes and i opted for the organic silver needle white tea supplied from Jing Tea. I was pleased to see they served the English-made Tregothnan Tea as well. I loved the style of the tea-ware and the teapot handles had pretty covers on them to stop you burning your hands. We had plenty of time to drink and chat before they bought round the cake stand and scones and therefore felt welcome and un-rushed. As you can see below, they really bring aesthetics to a new level and it almost looked too nice to ruin with my fork - almost! The waitress breezed through a quick presentation of what was being served and then offered us teapot refills. The proper way apparently is to eat all the sandwiches first and i thought i had graduated onto the cakes when the lady bought another plate of sandwiches round! Oh no! I couldn't manage another four but did my best and quickly moved onto the cakes and scones before i couldn't manage them! A nice touch with the jam was that it was quite smooth and i've since realised this stops you making a complete mess - useful! It was really nice to know the food was made on-site at their bakery as well, making it all the more personal and unique. There was a peaceful ambience in the tea room (until the i took a few photos!) and i noticed there was a broad range of groups; a young family, an older group, a few couples and a few mother and daughter tables. 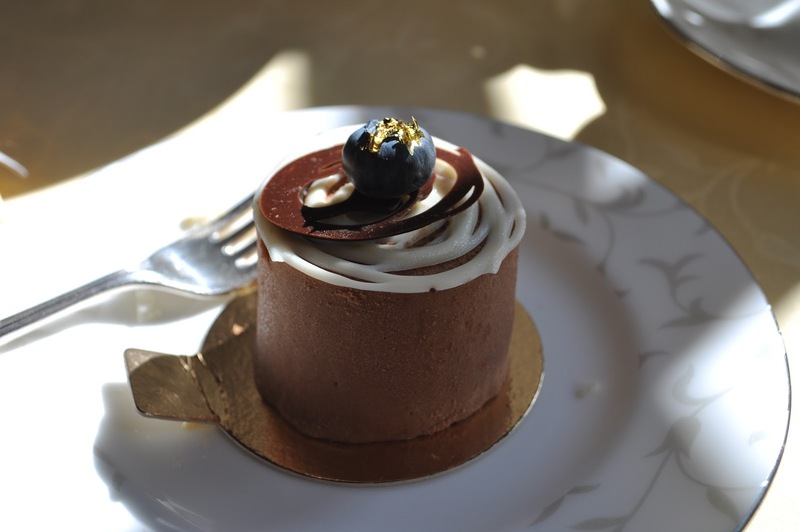 Look at this gorgeous cake with gold on the top! This was on my gluten-free cake stand and it's so good when a special diet doesn't get in the way of treating yourself. I just about managed this one at the end, but i had to bring some cookies, a brownie and a scone home for later! box even matches the tea-ware! Overall, i can see why Pennyhill Park won the Tea Guild Award and it felt like such a nice afternoon out you wish you could do it each week! 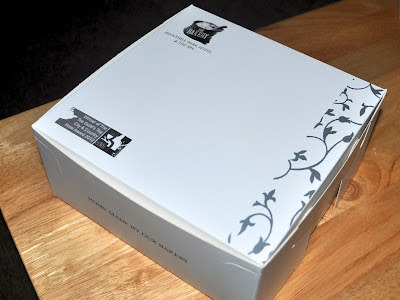 I think the price of £29.50 each was good value when you look at the quality of what's bought out to you, but at the same time possibly best kept for when you want to treat yourself a little, like the birthday we went for (perfect for that!). Also, being Pennyhill Park is a Hotel and Spa, i think i'd like to mix the accommodation and/or a spa break with this special treat and make the most of the Surrey location.